Are you looking for a space-themed font to add a futuristic and sci-fi vibe to your designs? Then this collection of space fonts is the best place to start! Space fonts line up with a popular trend that’s taking over the design world, especially in website headers, social media, posters, and print design. In this collection, we handpicked the best space and sci-fi fonts to cover all your design needs. Stargaze is a stunning space font that features a retro-futuristic design. The font also comes with letters that include both sharp and rounded corners. The big bold design makes this font perfect for everything from website design to movie posters, flyers, T-shirt design and more. This sans-serif font also comes with a unique sci-fi design that resembles outer space. The font includes alternate characters, multilingual support, and more. It’s great for crafting tech-related logos, business cards, and posters. Centauri is an all-caps font for the minimalists. It features a consistent design with wide spaced letters and comes with alternate letters and numbers as well. This font can be used to craft attractive covers for sci-fi novels and big posters. Derelict is a font that will remind you of space expeditions and futuristic movies. The font comes in both rough and clean designs for using it with various designs such as logos, social media posts, and posters. It also includes a web font version as well. This is a 2-in-1 bundle that comes with two different types of fonts, script font and sans font, featuring the same design. The font has a retro design with a space vibe, which makes it ideal for designing posters, T-shirt designs, greeting cards, and banners. 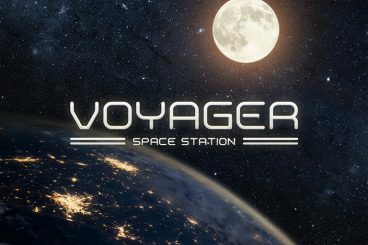 No need to travel to a galaxy far, far away to find a good space font, this font comes with a familiar design that all sci-fi movie fans will instantly fall in love with. Inspired by the Star Wars movies, this font features that same 80’s space look and feel for adding a retro effect to your design projects. At first glance, this font will give you a space horror vibe similar to the Alien movies. Helios is an all-caps font that features both rounded and normal corner designs along with alternate letters. It also comes with a web font version as well. Lauronos is a space font that features a classic design that you often see in space-themed movies from the early 70’s. It features both uppercase and lowercase letters and also includes 21 alternate characters and 25 glyphs as well. Primal is a sci-fi horror themed font that features a bold and wide letter design. It’s perfect for designing a modern logo, signage, business card, and posters. The font also includes multilingual letters and alternate versions of some of its letters. This is an experimental typeface with a bold and an unusual decorative design. The unique design of the letters makes this font certainly one of a kind. It’s ideal for crafting a poster or a website header. Bastille is a futuristic font that features a design inspired by the Blade Runner movies. It comes in both regular and italic styles. The font is suitable for designing movie posters, book covers, logos, T-Shirt designs and much more. Dreamscape is a stunning font with a unique design, which is best for all kinds of designs from website headers to music album covers, quote posts, banners, and more. The font comes in two styles as well. This is a font that comes with a design that’s truly out of this world. It will definitely make your text look as if it’s written in a weird alien language. Ichiji is a font that guaranteed to give your designs a unique look and feel. Freeline is a modern monogram font that also features a space-themed design. You can use it with various types of design projects from logo designs to website headers, banners, print design, and more. It also includes a web font version as well. LineTech is a web font that comes with a futuristic design. It comes in three different versions: Bold, Regular, and Light. This font is perfect for crafting a website call to action with a unique headline. Cosmodrome is a space-themed script font that also includes a web font version. The handwritten style design makes it ideal for designing signatures type logos and making T-shirt designs. Astronova font comes with both a modern and a space-themed design that gives out a retro vibe. It’s available in both regular and italic styles. It can be used to design retro-themed album covers, posters, flyers, and logos as well. This font features a creative steampunk-style design that can also be used with your futuristic sci-fi themed designs. With the right set of colors and combination, this font will make your designs look amazing. The Phantom font includes 6 different versions of the font. A modern all-caps font for designing logos, signage, blog headers, and social media posts. Azidhor comes with 24 alternate characters and 40 glyphs. As a bonus, the font pack also comes with 9 pre-designed logo vectors as well. This attractive font features a futuristic space-themed design that makes it perfect for luxury brands and high-end product based designs. According to its designer, the font is best used with silver or gold foil based designs. The font pack also comes with 15 free stock photos to use with your designs. Nemesis is a futuristic font that comes with an unusual design. It’s best for using with your poster and banner designs to attract more attention. The font comes in 4 different styles: regular, regular grunge, inline, and inline grunge. Luna is a serif font you can use to design posters, website headers, greeting cards, and social media posts. The font supports both uppercase and lowercase letters. Autorich is a modern sans-serif font that features a design that gives out a space vibe. The font comes packed complete with alternate letters, ligatures, figures, symbols, and more. It’s best for creating a unique brand identity for a modern company. Vision is a geometric display sans font that features a unique and futuristic design. It comes in both regular and bold styles. The font is perfect for creating logo designs, website headers, and branding work. For more great fonts, be sure to browse our poster fonts and hand lettering fonts collections as well.